After upgrading my host to 12.04 I can no longer connect to Windows Shares in my AD (Active Directory) based network. I was able to do it previously using 11.10. I thought it might be an issue with the upgrade so I flattened my box and re-installed from scratch and I still can't connect. When I use the Files>Connect to Server command, I am met with a constant password challenge when accessing any windows server using any known working network account. I checked the logs on the windows machine to see if there are failed connections but there are none, yet 12.04 asks me for my password over and over as if my credentials were wrong. It's syntax in this case that seems to be causing the issue. I can verify that when I type the server and domain in lowercase with my credentials, it does not connect. When I type the server and domain in all CAPS with my credentials, it connects just fine. I was having the same issue connecting to windows shares through nautilus. I was able to connect without issue by mounting shares from the command line, but it's just not as convenient. What fixed it for me was typing my domain in all caps. Lowercase domain name will never connect. Uppercase connects every time. Weird. Well if both your machines are connected over LAN then you should be able to access your windows machine using the Browse Network option in nautilus. It's definitely something with the GUI, because I had the same problem, but the method described in http://deathofagremmie.com/2012/05/01/mounting-a-synology-diskstation-on-ubuntu-12.04/ worked fine--at least, to attach to my Buffalo TeraStation on my local network. Can't say whether this will work in an AD environment. I had to use a domain\\username notice the extra slash there. 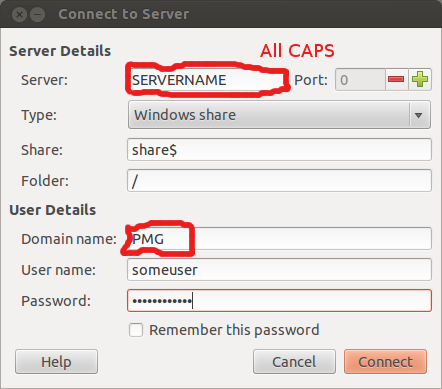 if I did an Alt-F2 and put in smb://Servername/sharename I had to add a \ before the username. This answer was in a different thread that I can't find at the moment. It worked perfectly and permanently for me. Active directory (AD) is a bit more complex than just samba sharing. AD is the replacement for the windows 'domains' and has an authentication server. It's not the same as workgroup based shares that just need cifs loaded and you're in. Had the same problems, i.e. able to connect to Windows shares on AD networks in Lucid (10.04) but not Precise (12.04). Seems slightly different syntax is needed. I accessed AD shares without problems by browsing the network in Nautilus and using 'domain\user' where 'domain' may be just the 2nd level domain in 'domain2.domain1.topleveldomain' (e.g. corp.mydomain.com) for user, then fully qualified domain name for domain, and then the password. Hope this helps. my username and domain were encoded in the "Location" field as smb://domain;username@server/share/folder when just upgraded from 11.10 to 12.04. I changed to smb://domain%5Cusername@server/share/folder and, after being asked for my password, I successfully connected. I guess this is in the spirit of the reply by jasonmyers. 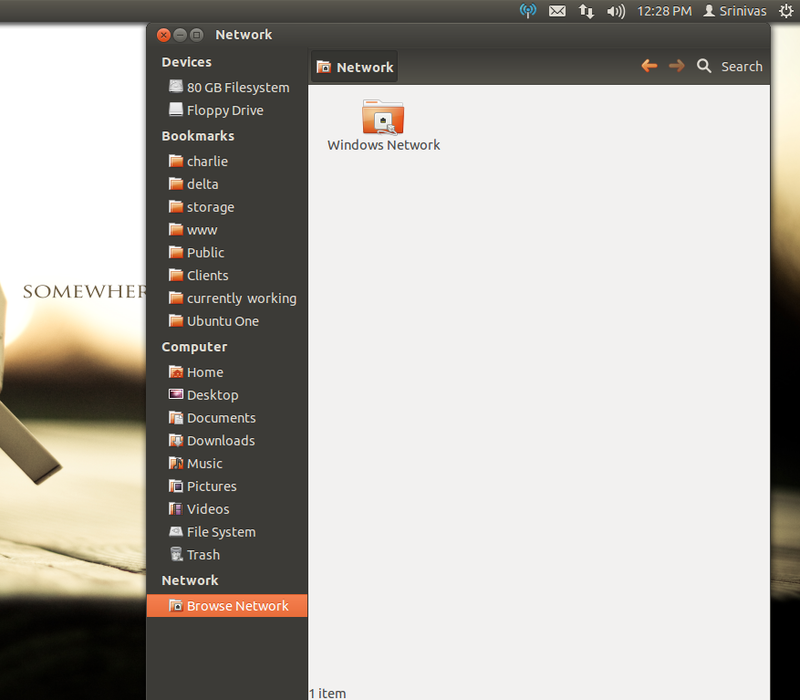 You can just type in the SMB path in the Ubuntu search tool (Alt + F4). That worked for me. Just type in smb://nas-server/some-path and it will load up. Not the answer you're looking for? Browse other questions tagged samba active-directory or ask your own question. How to open shared SMB resources in the form “\\host”? Any way to restore connect to windows share as a different user? How do I configure Samba so that Windows 10 doesn’t complain about insecure guest logons?